A typical laser maze is a rectangular room filled with a web of laser beams which players attempt to negotiate without “tripping” one of the beams. The idea behind the game comes from movies like the 1999 blockbuster film Entrapment, starring Catherine Zeta Jones and Sean Connery, Mission Impossible, and Ocean’s 12. 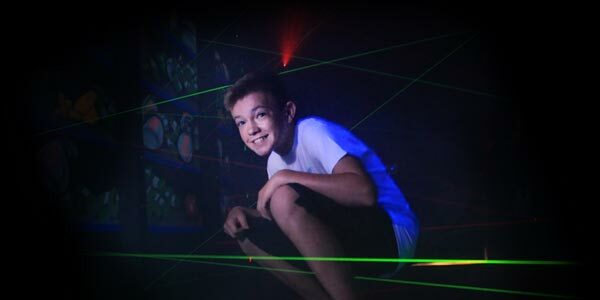 As an entertainment venue, laser mazes first hit the US market in 2002 but have only recently caught on as a viable, affordable, and highly profitable attraction. WHY SHOULD I CONSIDER A LASER MAZE? Appeal Children, teens, and adults of any age or gender love laser mazes! Players use their flexibility, speed, and agility to get under, over, or slink between the vibrant beams of laser light. WHY A LAZER MAZERS’ LASER MAZE? Lazer Mazers can design, build, deliver, and even install your maze in as little as four weeks. Lazer Mazers offers the lowest prices in the industry and we tell you upfront what your total costs will be. Lazer Mazers can work with you and your budget to design a unique, one of a kind laser maze with all the features and scenarios you can imagine. All of Lazer Mazers’ laser maze components are assembled, built, and installed by Lazer Mazers’ technicians. Lazer Mazers is not just a game manufacturer; we also operate our own maze so we understand what owners want and need in a laser maze attraction. Lazer Mazers’ game software and laser maze layout and design allow you to create an unlimited number of maze configurations as well as different game formats and mission objectives. Trainee, rookie, Veteran, and Elite (Beginner, Easy, Medium, and Hard) difficulty levels, each with their own maze configurations, keep guests coming back to improve their time and score. The Vault Assault theme adds the Trainee difficulty level for your youngest players. Utilizing vibrant red and vivid green lasers, high quality mirrors, motion sensors, fog, and sound effects, the Lazer Mazers experience is something your guests will always remember. Each Lazer Mazers package includes a 42” HD TV/Monitor and an ultra-low light, high-resolution camera which brings the live action to the full view of waiting guest, increasing buzz and sales! In addition to showing a live video feed of the game in progress, this monitor also serves as a scoreboard, displaying elapsed time, number of beams broken, and other game stats. Between games the “Attract Mode” shows the Top 10 Scores with players initials and a video demo loop that is certain to pique customers interest. Upon exiting the maze, each player receives a detailed score sheet telling them their ranking, how many laser beams they broke, their overall time, their split time, their penalty time, the date & time they played, and more. Score sheets also include 5 lines of customizable text for your business’ name, address, and phone number. Every component that makes up a Lazer Mazers laser maze is guaranteed for one full year from date of installation. In the unlikely event a component fails, a replacement will be sent free of charge and installation is quick and easy. Owners of a Lazer Mazers laser maze can access a password protected reporting menu that gives detailed usage and game information at a glance. HOW MUCH ROOM DO I NEED TO INSTALL A MAZE? Lazer Mazers’ systems can be installed in an area as small as 128 sq. feet. (8’ x 16’.) However, we recommend an area at least 8’ wide by 20’ long (160 sq. feet.) We advise against going too large and complex as it increases your throughput time, thus reducing your profitability and ROI (Return on Investment.) Multi-lane configurations are also possible, but require a minimum of 400 square feet. HOW MANY PLAYERS PLAY AT A TIME? Typically, a laser maze game is played one person at a time. However, team play can be accommodated and larger mazes allow for two or more players playing concurrently. All this flexibility is built into a Lazer Mazers package. The average time for a game of laser maze is about 75 seconds. Since players are competing against the clock and trying to get the fastest time, throughput is quite high. Lazer Mazers discourages overly complicated scenarios and unusually difficult mazes as they not only slow throughput, thus reducing your profitability, but also cause player frustration. Lazer Mazers works with you to create laser maze configurations that maximize playability and profit. HOW MUCH DO LOCATIONS CHARGE FOR A GAME OF LASER MAZE? Operators report charging $4.00 to $8.00 per play, depending upon location, maze size, theming and area demographics. Once a Lazer Mazers laser maze is installed, changing the configuration of the maze is as simple as clicking on or off on any of the lasers. Our software allows up to four levels of intensity; Trainee, Rookie, Veteran, or Elite, (Beginner, Easy, Medium and Hard) and dozens of combinations within each level can be achieved using our user-friendly interface. The Vault Assault theme adds the Trainee difficulty level for your youngest players. WHAT KIND OF MAINTENANCE ISSUES DO I NEED TO ANTICIPATE? All the components of a Lazer Mazers laser maze are fully guaranteed for one year from the date of installation. They are designed and built to be robust and reliable as well as easy to repair or replace should any part fail. The primary maintenance issues will be maintaining laser alignment, a quick and easy verification process, and routine housekeeping, which should include cleaning the mirrors at regular intervals. In addition to the thorough training provided at the time of installation, Lazer Mazers also provides an in-depth, fully illustrated manual, complete with trouble shooting tips and maintenance suggestions. Prior to opening each day, the lasers, mirrors, and sensor arrays should be aligned which takes approximately five minutes. Bi-weekly, the mirrors should be cleaned, which takes about fifteen minutes. HOW MUCH DOES A TYPICAL COMPLETE MAZE COST? That depends upon the size, theme, the amount of customization required (if any,) and whether or not you want to go portable. Lazer Mazers does not do new construction or build outs, but we do work closely with you or your contractor to ensure the room is ready for our 3-4 day installation and training. Our typical Heist themed maze runs $28,495 for all the necessary components and we charge between $1,500 and $3,000, depending upon the location, to install it. Unlike other vendors, Lazer Mazers is upfront with our pricing and there are no hidden costs or expensive “must have” options. To reserve your place in production, a non-refundable deposit of $500 is required. That deposit is applied toward the 25% down payment which is needed before work begins on building the components for your laser maze. When the maze is ready for shipment and/or installation, an additional 25% payment is required. After the maze has been installed and training has been completed, the remaining 50% balance is due. Yes, Lazer Mazers works with Pinnacle Financing to offer various payment plans. They can finance all or part of your maze purchase. Contact Tom DeWinter at his email tomd@pinnaclelease.com or give him a call at (720) 204-4504. Please see our Return on Investment page. DO YOU OFFER A POINT-OF-SALE KIOSK OR SELF-SERVE AUTO ATTENDANT? An unattended maze is subject to vandalism and down time. A properly trained attendant (can be a “floater”) adds interactivity and can increase sales dramatically. HOW LONG DOES IT TAKE FROM TIME OF ORDER TO BE FULLY OPERATIONAL? Generally, Lazer Mazers can fill an order for a complete maze system in 3-6 weeks. The installation and training process usually takes 3-4 days. Since we do not do the actual construction of the room where the maze is to be installed, we have no direct control over the time needed to perform that task. WHAT NEEDS TO BE DONE PRIOR TO A LAZER MAZERS INSTALLATION? Lazer Mazers will provide you or your contractor all the site preparation details necessary to make the installation a quick and easy process. Items such as electrical outlet placement, wall framing, building materials, lighting, flooring, etc. will all be covered. From the time you place an order until the grand opening of your new laser maze, Lazer Mazers will work closely with you to make sure you are operational in as little time as possible. A five hundred dollar ($500 US) non-refundable deposit is all it takes to start the process. In as little as four weeks you can be pulling in profits with your brand new Lazer Mazers laser maze!